This cycle route passes the west port basins, crosses the North Sea Canal by ferry, through the polder village of Westzaan, to a heritage windmill park on the Zaan river, and back along the still-industrial riverside. 40 km, 4-5 hours. Revised February 2019.
start at Haarlemmerplein (square) on the western edge of the historic core of Amsterdam, in front of the Willemspoort, a triumphal arch built in 1840. (Covered in scaffolding for renovation, 2019). go under the railway viaduct, cycling alongside the tramline – this is Plancius straat. 100 m further, turn left into Eerste Breeuwers straat, and then immediately turn right into Houtman straat. This is a pedestrianised street with 19th-century social housing, now largely gentrified. at the end, you are back on Plancius straat. Turn left, and cross the bridge over the canal (Zoutkeetsgracht). at the end of Plancius straat is the square Zoutkeets plein: turn left, and then right, onto the Houtman kade. This is still recognisably a quayside (‘kade’ = quay). at the end of the Houtman kade, at the busy Van Diemen straat, turn left across the canal. It is the main shipping route through west Amsterdam. pass the tunnel entrance. The cycle path then turns back to the older houses, along Tasman straat. continue along the wide new cycle path, and pass the tunnel exit (now on your right). pass a railway depot, the rear of a petrol station, and a large antenna mast, and continue into the port zone. pass the Mercuriushaven, formerly a grain dock. continue toward a motorway viaduct – it takes the ring motorway to the Coen tunnel (under the North Sea Canal). at the motorway junction go straight on, following the cycle sign for Zaanstad. From here, the road is primarily access to the ferry. The rail line alongside the road is the original route across the North Sea Canal, over a swing bridge. In 1983, the bridge was replaced by a tunnel, and the rail line was relocated further west. pass the Hemcentrale – the main power station of Amsterdam. It consists of a powder coal unit of 630MW, and a 435MW combined-cycle unit. 300 m on, a viaduct crosses the road, an enclosed conveyor belt carrying coal to the power station, from the Amsterdam Bulk Terminal on the left. continue past oil tanks: although Rotterdam dominates oil and bulk traffic, Amsterdam has increased its share of refined fuel traffic. about 2 km after the motorway viaduct, you reach the ferry landing stage at the North Sea Canal. This is the ship canal to the port basins, which are about 20 km inland. The primary function of the ferry is to provide a diversionary route, for dangerous cargo not allowed in the road tunnels. Diagonally opposite is a white building, the former national Artillery Establishment – Staatsbedrijf der Artillerie-Inrichtingen. It is part of a larger military complex, begun in 1899, strategically located at the former rail bridge over the North Sea Canal. The new sculpture at the ferry is inspired by Dutch porcelain souvenir dolls, and a sign encourages you to take a selfie. cross by the ferry (every 20 minutes, free). On the other side is the provincial highway to Alkmaar, one of the first-generation motor roads in the Netherlands (opened 1934). for all other settlements, the provincial survey Monumenten Inventarisatie Project Noord-Holland Series published by the Provincie Noord-Holland. take the cycle path away from the ferry, towards Zaandam. Pass a roundabout, and go straight on, through the new cycle underpass. at the next traffic lights, turn right across the main road, toward the Cafeteria. Then turn left along the waterside road, past the statue, and the houseboats. continue along the road as it bends right, parallel to the harbour. This is the former port area of Zaandam, once a main timber port. Together with other settlements along the Zaan river, Zaandam was absorbed into Zaanstad municipality in 1974. The municipality has 150 000 inhabitants. cross the narrow wooden lifting bridge: go straight on, into Czarina straat (Tsarina street). turn right at the small public garden, the Czaar Peter Plantsoen (Tsar Peter Garden). At the end of the street is the explanation for Zaandam’s Russian connection – the Czaar Peter huisje. Preserved as a shrine, inside a 19th-century building, is the little wooden house where Tsar Peter the Great stayed in 1697. (Entrance on the other side, open Tuesday-Sunday 10:00 to 17:00). The Tsar came to Zaandam to learn shipbuilding: his visit to Holland and England is an episode of symbolic significance in Russian history. It was an admission that Russia was backward, and needed to learn from the west – a policy opposed at the time, and ever since. Most Russian tourists in the Netherlands visit Zaandam, and so did Vladimir Vladimirovich Putin, Ph.D.
turn back to Czarina straat, and turn right to continue. This is a low-income neighbourhood, at the edge of the town centre. pass the rear entrance to Rozenhof, a small shopping centre. The street bends left here into Rozengracht, a paved open space. (Some days there is a street market, and if so, step off your bike). go on to the end of the street, past the green wooden wall of the new C & A store. 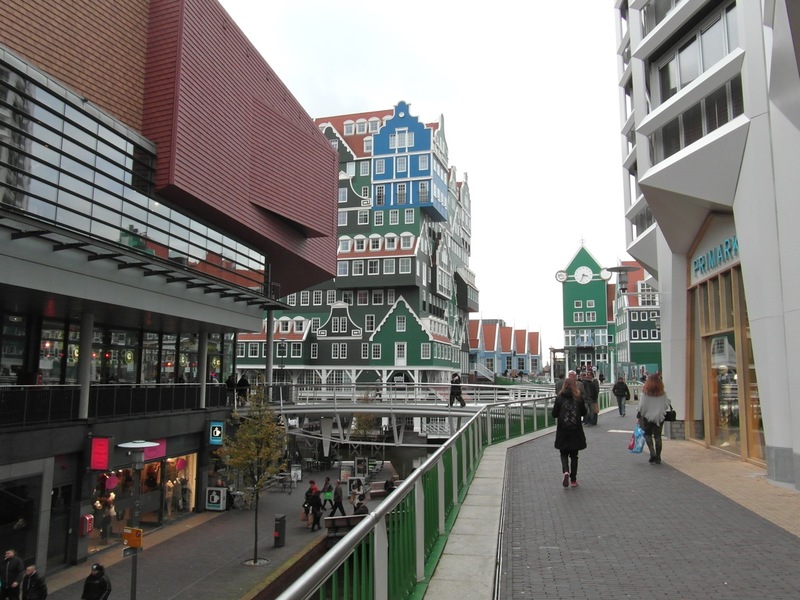 Turn right, and suddenly you are in the new city centre of Zaandam. at the next corner, turn left. Step off your bike, and go up the pedestrian ramp, on the right of the small canal, past The Sting store. This is the heart of the new development, Inverdan. The pedestrian route is raised, to cross the main road toward the station. The building ahead, with the Mickey Mouse ‘ears’, is the station entrance. To your left, the new Inntel hotel: the green gables mimic the region’s traditional architecture, which you will see later. as you pass Primark, you cross a cycle path: it is not immediate recognisable as such. You can get on your bike again: turn left down this path. at the end, turn right to continue. Be careful here – this is an access road with a cycle path, but you can’t tell them apart. The cycle path is the left half of the road surface. cross the main road: use the cycle crossing! On the other side, immediately turn right, and then left, into the cycle tunnel. This layout may change during development: follow the cycle sign for Westerwatering. cycle through the tunnel under the railway. At the end, it turns 180 degrees, so you are facing back to the station. turn left here, along the cycle path, cycle sign for Westerwatering. Construction work: turn left immediately after the small canal, and then turn into Blokschaaf – the street name sign is at nr. 121. The construction work is for a new cycle bridge and footbridge. go straight on through the housing, crossing a cycle bridge. After a second cycle bridge, turn left, up to a road bridge (Mandela straat). at the end turn right, along Westzanerdijk – there is no street name sign here. The street is raised, because it is the mediaeval sea dike of the northern IJ estuary. There are stepped alleys between the houses, typical for dike settlements. Further on, the houses are at the foot of the dike. pass on the right (between nr. 306 and nr. 312) a small Jewish cemetery. As you continue along the dike, the historical pattern is visible. There are sections of canal below the dike on the right, with some older farm buildings. Some have their own entrance bridge across the canal – a typical feature of this region. They back onto grazing land – the ‘old land’, reclaimed in the Middle Ages. Everything on your left is built on 19th-century polders, reclaimed from the tidal IJ estuary. This pattern is visible at several places in the Amsterdam region: an isolated sea-dike with different landscapes on either side. pass several weather-boarded buildings in the regional colour Zaan green (Zaans groen). just after these houses, stop at the pumping station, Gemaal Overtoom. Look into the pump building on the right, to see the two electric pumps which drain the area. The pump channel runs under the road. go on from the pumping station, crossing an old lock, and then continue along the dike road. after another 200 m, turn right into Zuideinde. This is the start of Westzaan, a linear polder settlement. After the first house right, there is a map. You can see the line of the sea-dike, the straight line of the North Sea Canal, and the linear structure of Westzaan village itself. The village extends 4 km, from the old sea dike northwards. This is exactly the same structure as the village of Oostzaan, on the other side of the Zaan river. Both are aligned parallel to the river, the pattern of mediaeval reclamation of the peat bogs. cycle on along the long village street. The housing is concentrated at both ends – in the middle there are fewer houses, and some working farms. Several channels cross the village street at right angles. This is part of the mediaeval reclamation pattern: broad channels parallel to the Zaan river, villages also parallel to the river, smaller ditches and canals at right angles to them both. Even the small channels were used for transport of hay and cattle. about 3 km further, cycle into the oldest part of Westzaan: Kerkbuurt (‘church quarter’). At the centre of the old village, in the middle of the road, is the old town hall. 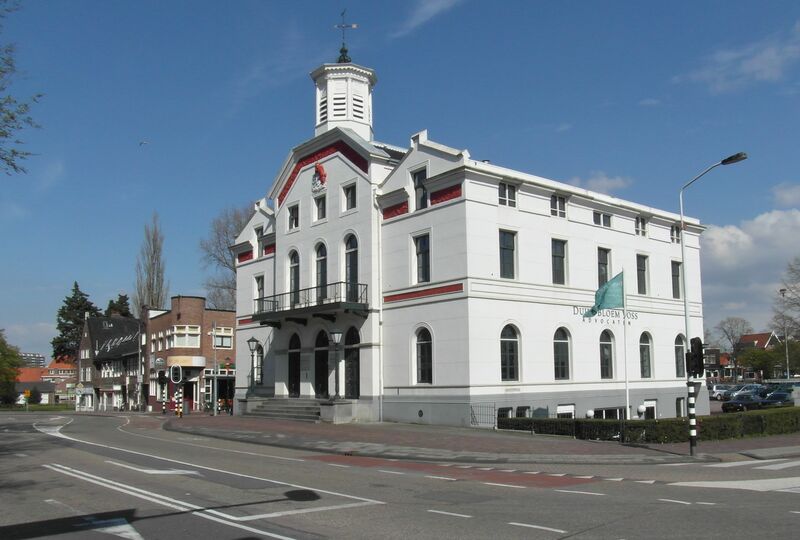 Westzaan was also absorbed into Zaanstad in 1974, and the old town hall is relegated to a heritage wedding location. The inscription above the door is a chronogram – add up the letters which correspond to Roman numerals, and you get the date of construction. continue through Kerkbuurt: then suddenly the village street is cut by the provincial road (Provinciale weg). Visible on the left, the water tower of Assendelft. cross the road, and turn right, in the direction of Koog a/d Zaan (= Koog aan de Zaan), along a broad cycle path. after 700 m, the main road turns right: you cycle straight on, on the cycle path, past a windmill. This is the abandoned route of the provincial road, which was relocated to make a junction with the motorway. 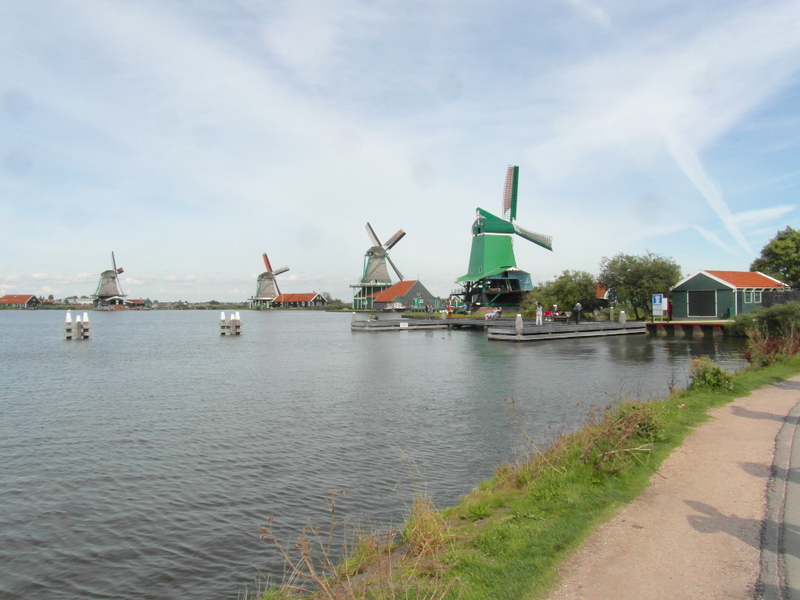 The windmill is a unique paper mill – De Schoolmeester. Before steam engines, wind and turf were the energy sources, for the early industries of the Zaan region. Open most workdays from 10.00 to 16.00, entrance € 2,50.
the old road stops dead, as it reaches the motorway embankment: cycle on along the path. On the right, some grassland has been abandoned deliberately to revert to New Nature (a pseudo-natural landscape). The reed-covered marsh, with scrub and low trees, is similar to the original vegetation of the region. at the end of this cycle path, turn left under the motorway. pass the regional police headquarters. At the roundabout, turn right, cycle sign for Zaanse Schans. cycle on toward the Olam Cocoa factory – you may have smelled the cocoa already. At the end of the street are the Amsterdam-Alkmaar railway, and the parallel main road. Together, they form the axis of Zaanstad. cross the railway, and then the main road: use the separate traffic lights for cyclists. on the other side, immediately turn left, along the parallel access road (ignore the sign for Zaanse Schans here). after 100 m, turn right into Linden laan. at the end of Linden laan, go straight on into Park straat, not Park laan. The houses get older here. at the end of this narrow street, turn right. 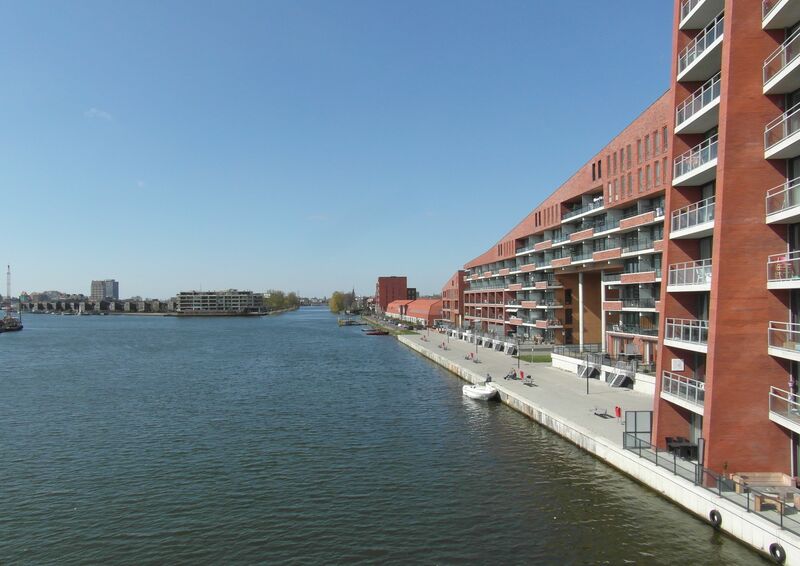 This is the oldest part of the settlement Zaandijk – as the name implies, it is built on the Zaan river dike. continue towards the windmill De Bleke Dood – ‘Pale Death’. Just before it, there is a bakery, Het Zaanse Bakkertje, and a Spar shop: you can buy something to eat at the Zaanse Schans. turn left at the Spar shop, before the windmill, and cross the Zaan river by the new bridge. Use the cycle path! turn left at the cycle sign after the bridge, into the Zaanse Schans architectural heritage collection, and cycle on past the row of wooden houses. There is a map at the entrance, by the steps. pass first a mustard mill, then a saw-mill, a paint mill, and an oil mill. Windmills were not only used for pumping water and milling grain, but as a source of industrial power. Although these mills have been re-located here, the location is authentic. The banks of the Zaan river formed probably the largest proto-industrial concentration in early modern Europe (German: Theorien der Proto-Industrialisierung). It was probably the largest collection of windmills ever constructed – several hundred in the 17th century. Specialised windmills such as sawmills, oilseed mills, paper mills, and hemp mills were concentrated in different locations. The Zaan is still an industrial river, as you will see on the return route. after you have seen all the windmills, turn back to the entrance. Follow the sign for Het Kalf, and the low sign for long-distance route LF 7a, and cross the road, using the cycle crossing. on the other side, pass the Pepsico sign, and go on past the factories and sheds. You now detour around an inlet, De Poel. The industry was originally located here for water transport. at the end of the road, continue on a short cycle path. Again follow the cycle sign for LF 7a, turn right onto a narrow street, with Zaan-green weatherboarded houses. at the end of the street, cross the narrow lifting bridge, and turn right: the road is simply called ‘Kalf’. You can see the whole inlet here. continue along this road, parallel to the bank of the inlet. When you reach a grassed riverbank with trees, opposite the Tate & Lyle starch factory, you are on the bank of the river Zaan. The riverside industry is part of the second industrialisation of the Zaan. In the proto-industrial period (1580-1700), shipbuilding and associated trades were dominant. A long period of decline followed. In the late 19th century the region re-industrialised, processing colonial imports and industrial crops. That gave it the regional smell: starch and cocoa. continue past the Gerkens Cacao factory: you turn away from the river here. At the next corner, turn back toward the river, toward the building with the stylised letters ZOR. go on past the ZOR or Zaanlandse Olie Raffinarderij BV. (The ‘dead end’ sign is not for cyclists). You are now back on the riverside road: the non-tourist industrial riverside. pass under the motorway bridge (A8, the one you passed north of Westzaan). After this is more housing: very little of it looks planned. The riverside mixture contrasts with the usual strong functional separation (‘zoning’). By Dutch standards, Zaanstad has a very amorphous urban structure. There is industry, 19th-century housing, older wooden heritage houses, and expensive new apartments. go straight on across a bridge access road, pass another Gerkens Cacao factory, and then go under the rail viaduct of the Zaandam-Purmerend line. pass an open section of riverbank. On both banks you can see new apartments – the probable future of the entire riverside, after the factories have been relocated. continue under the newest Zaan bridge (opened 2006). The riverside road is now called Oost Zijde. The side streets at right angles replicate the older field pattern, itself the product of mediaeval reclamation. The river bank was settled first, the reclamation went inland from there: the alignment of Westzaan is part of the same pattern. go to the riverbank, and go left onto the boardwalk along the river. Don’t cycle, but walk along the boardwalk. Visible opposite is the Verkade biscuit factory (1904) – once the largest factory in Zaandam. pass the church of St. Bonifatius – part of a complex of Catholic religious buildings and schools, built around 1900. Beside the door is a war monument, thanking Christ the King for preservation in times of war. On the priest’s house (right) is a plaque, commemorating the Catholic resistance group based here during the German occupation. This ‘catholicising’ of the war is probably a reaction to communist influence in the post-war years – the industrial Zaan region was by Dutch standards ‘red’. at the traffic lights, just after the church, turn right, over the bridge. On the left is the main Zaan river lock. 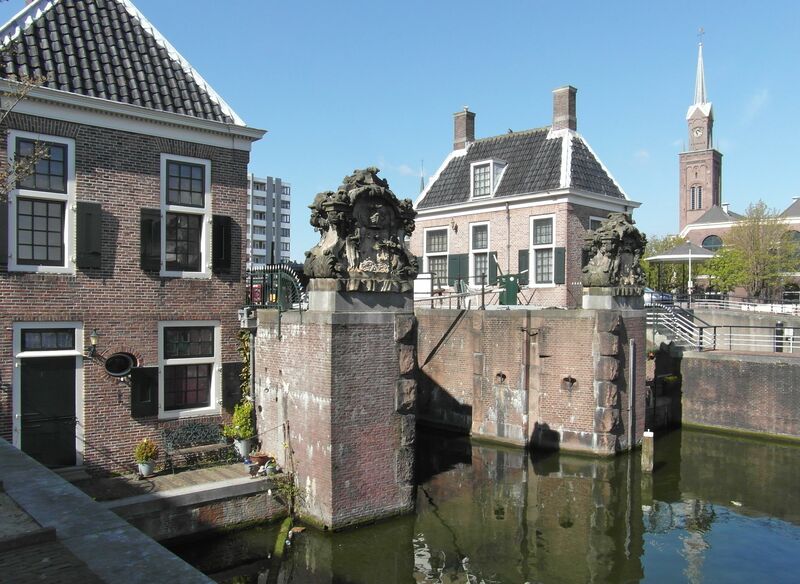 Beside it are the oldest surviving Zaan locks, with two lock-houses, and a stone coat of arms on each side. This is the approximate site of the original dam in the Zaan, built around 1300. The dam isolated the river from the tidal IJ estuary, and gave Zaandam its name, just like Amsterdam. In both cases, the spelling has changed over the centuries: originally Aemstelredam and Saendam. after the bridge, at the bus stop, turn left into Dam straat. Go straight on through the square called ‘Dam’. This is the exact equivalent of “Dam Square” in Amsterdam, which is also simply called ‘Dam’ in Dutch. Both were the main square of the mediaeval settlement, both were located next to the dam in the river, which was the only river crossing in both towns. The undistinguished 19th-century buildings around the square are now cafes: this is the heart of Zaan night-life, such as it is. In the middle of the square is a statue of Tsar Peter, a gift of the last Tsar, Nicholas, in 1911.
go straight on past the statue, out of the square. At the street (Czaar Peter straat), turn left, back to the river. cross the river again. Beside the locks is the Zaan gemaal, a pumping station which now drains the river – natural flow is no longer sufficient. across the bridge is a prominent white building, the former Town Hall of Zaandam (1848). Pass it, and immediately turn right into Zuiddijk, on the cycle path. continue along the cycle path, and then on through Zuiddijk, ‘south dike’. This too is a raised sea dike: the tidal estuary was on the right, but the difference in height is most visible on the left. You can see this at nr. 220, where you cross a small lock, linking the estuary to inland canals. Many of the houses along Zuiddijk are small and run-down: toward the end, there is new housing on the harbour side. the street ends abruptly, at a bridge approach road. (Look left, there are alpacas). Turn right, along the cycle path, toward the new apartment tower. pass the apartment tower, and cycle across the new cycle bridge, built next to a motorway link road. From the bridge there is a good view of the former Zaan estuary. When the North Sea Canal was built, the entire IJ / Zaan estuary was regulated, and ceased to be tidal water. That allowed the development of its banks as a port zone. Housing is now displacing industry here. 200 m after the bridge, make a U-turn, down to the waterside road. Turn right, under the bridge, to go back to the ferry. pass the entrance to the former military complex Algemeen Verdedigingspark – Militair Complex Hembrug. It was planned as the strategic centre of the Amsterdam defence line, the Stelling van Amsterdam. Most of the buildings date from the First World War. The 42-hectare site was recently sold to a developer, and some buildings already have new uses. 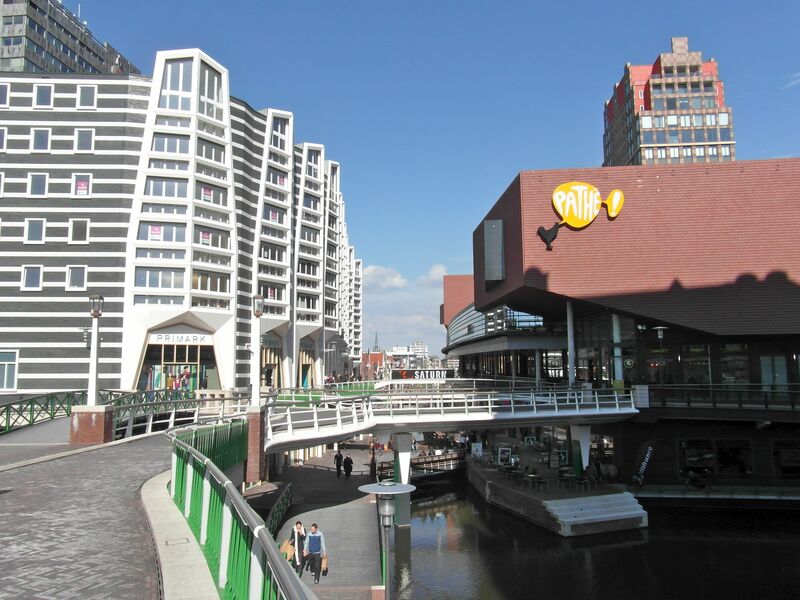 Large-scale redevelopment is planned for the next 20 years, possibly with a new metro line to Amsterdam. 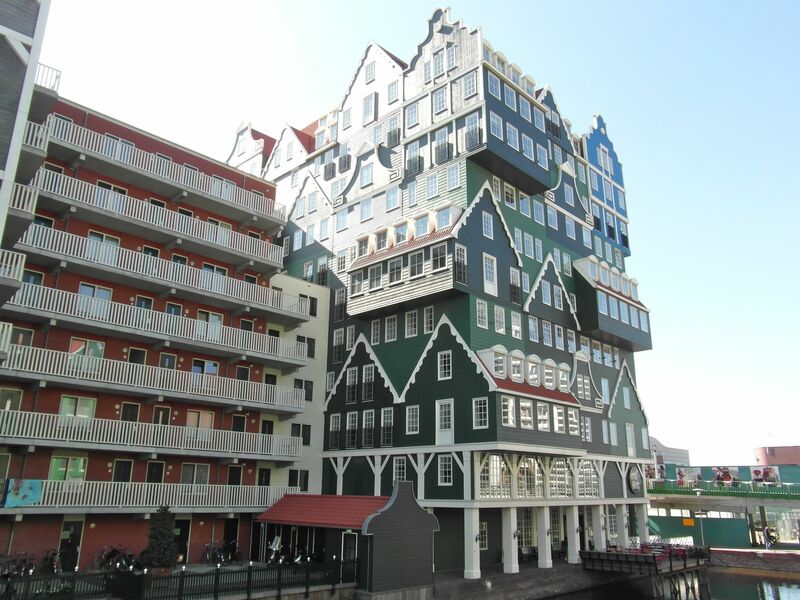 pass the last houses of Zaandam. As the channel joins the North Sea Canal, several port basins are visible. There are benches to sit and watch the ships. the quayside road curves westwards: pass the former ammunition factory. The initials and date are still prominent on the facade (AI 1956 = Artillerie Inrichting 1956). after the last gate of the complex, you are back at the ferry, where you crossed on the outward route. cross by the ferry, and cycle back toward Amsterdam: back past the oil tanks, the power station, the motorway junction, the Mercurius dock, and the antenna mast. Stay on this side of the road. pass the Amsterdam Art Hotel, and then turn next right into Zaan straat. Follow this long street, parallel to the rail line. after a short section of cycle path, turn right under the rail bridge. Diversion 2019: the last section is closed for construction work. Follow the yellow diversion signs, turn left and then right, and then go under the rail bridge. at the traffic lights, turn left toward the triumphal arch, to return to Haarlemmer plein, end point of this route. This entry was posted in Cycle routes and tagged Amsterdam, bike, cycle route, cycling, Westzaan, Zaandam. Bookmark the permalink.